Bamboo Hut Bungalow is a small hut close to the community facilities but still far enough away for privacy. 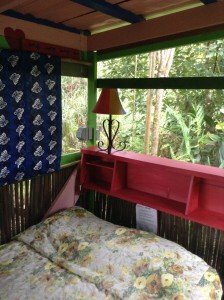 At 8×8 feet, it is an intimate and totally cute little hut with a freshly painted red trim. 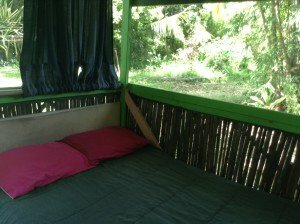 The Bamboo Bungalow is cozy and rustic. However, it has electricity and light. It is the only lodging along with Kahuna Cabin and the Jungle Cottage that has electricity. Close to Facilities! 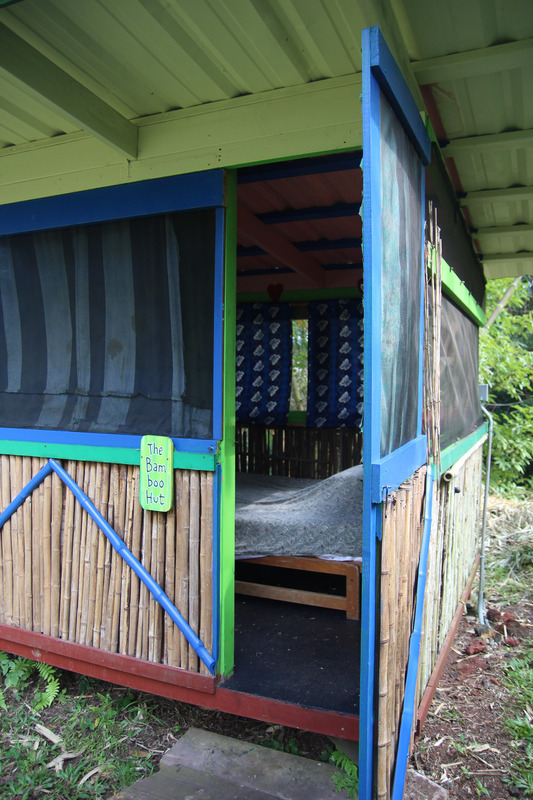 This is also the closest accommodation to our famous Eco-Toilet and Solar Jungle Shower. The bathroom is an eco-friendly flush toilet with a view. 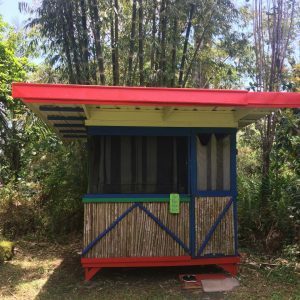 Our hot water, semi-outdoor Jungle Shower is a lush luxury that allows you to enjoy getting clean in the rainforest in style. The insect screen windows allow the beautiful ocean breeze in but not the mosquitos! Using recycled & renewable materials leaves a very low carbon footprint compared to staying in a traditional hotel. 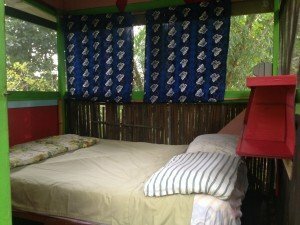 It also allows us to offer accommodations at a cheap price! Uses Salvaged Lumber and locally grown Bamboo! All cleaning is done with eco-friendly products with limited use of other products such as bleach. Trash & Recycling: We ask that you take your trash and recyclables down to the Recycling Zone and separate them accordingly. Live in Community. Weekly/Monthly Specials! We offer weekly or monthly rates for those who wish to enjoy working one light Community Support Shift per week.